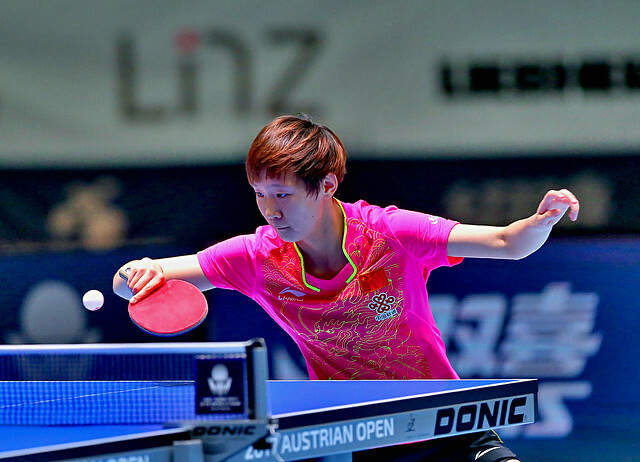 The surprise winner of the Girls’ Singles title at the 2014 ITTF World Junior Circuit Finals, staged in the Paraguayan capital city of Asuncion in January 2015, when beating Japan’s Ayane Morita in the title deciding contest, Chinese Taipei’s Huang Yu-Chiao caused the biggest upset, as play progressed to the quarter-final stage of the Under 21 Women’s Singles event at the Seamaster 2017 ITTF World Tour Platinum Hybiorme Austrian Open in Linz on the morning of Tuesday 19th September. Furthermore, once again she demonstrated a liking for Japan’s adversaries. After accounting for the host nation’s Teresa Oppelz (11-5, 11-5, 11-6); the no.15 seed, she overcame Maki Shiomi, the top seed and winner earlier this year in China (11-7, 11-6, 11-6). One surprise name in the quarter-final line-up and there were two more; Germany experiencing mixed fortunes. In round two, Nina Mittelham, the no.7 seed, suffered at the hands of China’s Zhang Rui (11-7, 11-4, 8-11, 11-6); conversely, Wan Yuan, the no.13 seed, overcame Laura Pfeffer of France, the no.19 seed (13-11, 11-9, 11-5). Notably, Laura Pfeffer was a player in good form; in the opening round she had accounted for Hong Kong’s Mak Tze Wing, the no.6 seed (11-9, 4-11, 6-11, 12-10, 11-6). Meanwhile, in the remaining contests that decided last eight places, matters advanced at status advised. Minnie Soo Wai Yam, the no.2 seed, beat Hong Kong colleague, Lam Yee Lok, the no.10 seed (11-5, 11-2, 11-5); similarly, the Japanese duo of Kyoka Kato, the no.3 seed and Miyu Maeda, the no.4 seed, enjoyed success. Kyoka Kato recovered from a two games to nil deficit to overcome China’s Wang Yidi, the no.26 seed (4-11, 8-11, 15-13, 11-4, 13-11); Miyu Maeda ended the progress of Chinese Taipei’s Huang Yu-Wen, the no.12 seed (11-7, 11-4, 13-11). Last eight places for two Japanese players, there was a place for one more; Miyu Nagasaki, the no.8 seed, overcame compatriot, Yuka Umemura (11-9, 9-11, 11-3, 11-9) to keep her hopes alive. Three quarter-final places for Japan; it was two for China; Chen Ke, the no.5 seed, halted the aspirations of Sun Mingyang, the no.29 seed (11-9, 11-9, 11-7), to keep her medal hopes alive. At the quarter-final stage, Huang Yu-Chiao meets Zhang Rui, Chen Ke opposes Kyoka Kato; in the opposite half of the draw, Miyu Maeda faces Wan Yuan, Minnie Soo Wai Yam confronts Miyu Nagazaki.